Welcome to the March Round up Post! I can’t believe it is almost Easter and the end of March already. The beautiful photo of the Fritillaria was taken Easter 2017 in the old house garden. I really hope this cold rain goes away soon! We had 20 link ups this month which is absolutely fabulous! We also had a winner for the competition and that was Joshua from 30daysofwildparenting. Well done Joshua! Your prizes are on their way already! What a lovely blog! Ali posted 3 wonderful posts this month, so thank you Ali! My favourite was about the gang of birds that Ali has been watching in her garden which she gave fun names too! I also love watching the birds in the old house garden and try to encourage a range by adding all their favourite foods. Thank you Ali, please do come back in April for the next link up. Another new linker. Welcome Emma! Emma posted 2 posts; my favourite being about Vericomposting which is composting with worms. I knew a little about this already but this post was full of great information for an amateur gardener like me. She also tells you exactly how to compost with worms if you are unsure. Thank you Emma, do come back next month. Hello Brigid! Lovely to see that you posted 2 blog posts this month. Brigid posted one about her beautiful garden throughout the year but my favourite was a post about her garden in February. I love the optimism at this time of the year, don’t you? All the exciting new growth about to appear. Thank you Brigid, hope to see you again next month. Tione is a new linker. Tione posted a piece about tips that every gardener should know. I like the tip about making a homemade insecticide to help keep away the green flies and the tips about not being worried to make mistakes. I hope we see you in April, Tione and that you found some lovely blogs to read. Thomas is a professional so I feel I should always listen to him. He posted a great guide to some books that he feels are useful to any gardener. I remember my uncle reading the old rose book and, from the comments, it looks as if other gardeners have found this very useful. Thanks for posting Thomas, hope to see you next month. Ann linked 3 posts this month; all of which are brilliant. I especially love Ann’s posts as they are so Pinable (is that a word?!). Anyway, if you are into Pinterest, pop over to Ann’s blog for some wonderful posts about everything garden. My favourite from the three was her post about building an eco-friendly garden. You may know, this is always our aim in the old house. Ditch the chemicals and invite the wildlife in and soon you will have a ecosystem that should sustain itself without too much worry. Thank you Ann. Do pop back next month. As well as being the competition winner, Joshua linked a post about Gardening kindle ideas. Whilst Thomas brought us old book ideas, Joshua brought us reading material for a kindle. I like the look of the Mindfulness book here as that sounds like my kind of read! Thank you Joshua and congratulations once again! Lovely to read a post from Paul all about the tropical plants to be found at Abbotsbury. I love finding inspiration from visiting other gardens and this type of post inspired the MyGloriousGardens Linky. The old house garden is more of a cottage garden but tropical plants can be stunning especially for adding drama to the garden. Thank you Paul! Hope to see you next month. What a fabulous name for a blog! Another new linker and welcome to Lucy. Lucy linked 2 posts this month. My favourite was about using old welly boots as planters for herbs. What a fabulouly fun idea; especially with children! In fact, do check out her blog as it full of amazing posts that are inspiring and hopefully will encourage more families to get outdoors. Thank you Lucy. Hope to see you next month. Lovely to see you have linked again Craig. Craig linked 2 posts but my favourite was about his hunt for the reliable outdoor tomatoes. I think I need to visit this post again as we always have trouble with tomatoes in the old house garden! He has sown loads of different seeds so do pop back and check out how they are all getting on over at his blog. Thank you Craig. Do pop back next month. Well, that’s it folks! Another lovely link party round up for March! 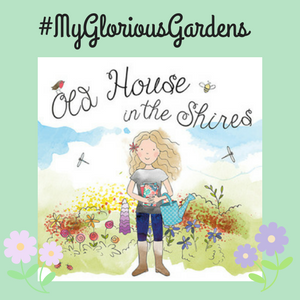 I hope to see you all linking next week when the April #MyGloriousGardens will open. Remember the earlier you link in the first 2 weeks of the month, the more Linky love you will receive from other bloggers. I shall leave you with a picture of our new wildlife pond which we have been working on. Happy Gardening! The new wildlife pond is coming on! Thanks so much for the mention, I’m really glad I found your wonderful linky and thanks for hosting. I will definitely link when I have gardening posts. Thank you for the mention and the new blog recommendations. I will be visiting those sites too. So many lovely blog posts to read! Thank you Sophie. Happy Easter. ?? ?